Trout Lake Farm is an incredible team operated endeavor. You might be amazed at how many steps are involved in growing and processing our herbs. We take pride in our efforts to ship you the purest safest organic botanicals possible. Trout Lake Farm is not only certified organic in growing our botanicals, but also as a handler and processor. In order to maintain our certification we must follow and document our adherence to a rigorous protocol. We test and monitor our herbs from the time the dry herbs enter the warehouse, through milling and packaging for shipment. Here is a sample of the care we take in processing your herbs to get them from the dryer to the truck, and then to your door. 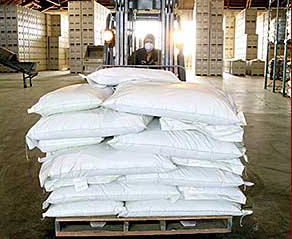 The farm delivers the dry material to the mill by trailer.The material is transferred from the trailers into plastic totes. They are weighed and quantities are verified. As totes are loaded, composite samples are provided to QA for incoming microbial testing (Salmonella, E. coli, plate count, yeast, and mold). We also internally grade physical characteristics of the product at this time. After QC release, the herbs are moved to the warehouse and staged for milling and further processing. Depending on customer needs, cut size is chosen and milling begins. During the milling process, product is routinely tested for particle size and bulk density. Milling equipment is constantly monitored to ensure consistency. 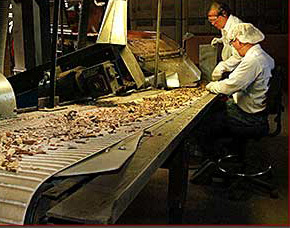 QA samples are pulled during milling to form a composite sample for final testing. Upon final approval from QA, the bags of finished product are loaded into the warehouse to await shipment. Before loading finished product into trucks, we inspect the trucks for cleanliness, load compatibility, and contaminants. Clean, safe, certified 100% organic herbs are on their way to our valued customers.